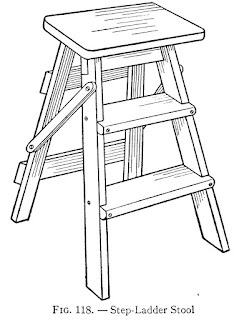 A Step-Ladder Stool is of just the right height for general household use, for washing woodwork, or for reaching upper shelves in the pantry. It also makes an excellent kitchen stool, the lower step serving the purpose of a foot-rest. 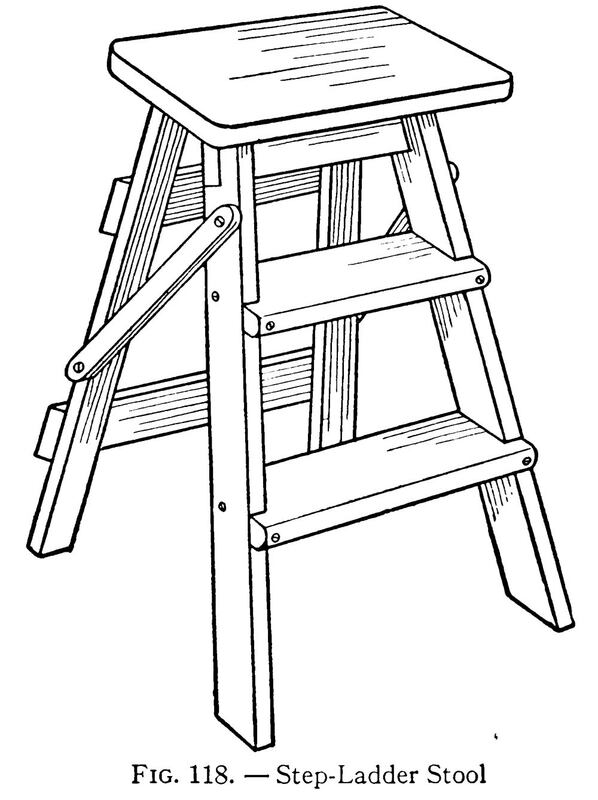 When the ladder-stool is not in use, it may be folded into the compact form shown in Fig. 119, and stood behind a door or in some other out of the way place. 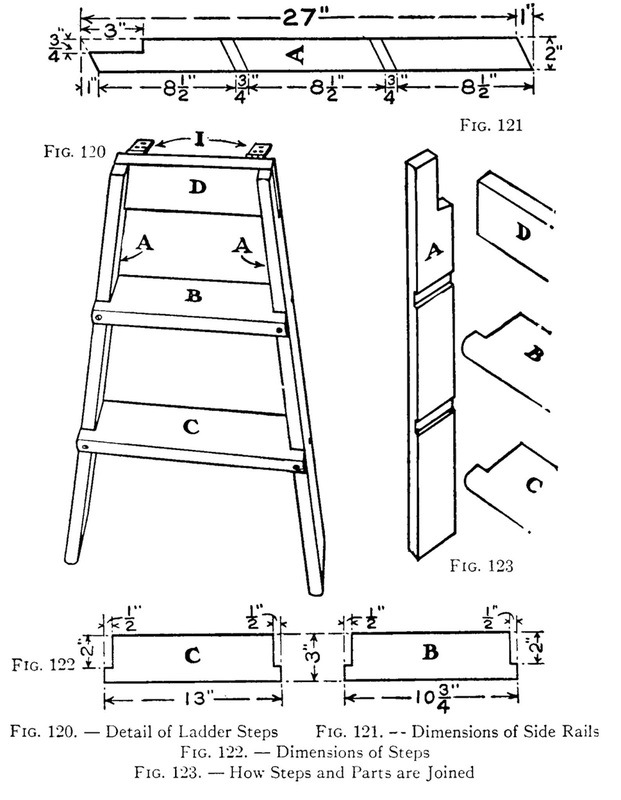 The Ladder consists of three portions, the steps (Fig. 120), the rear legs (Fig. 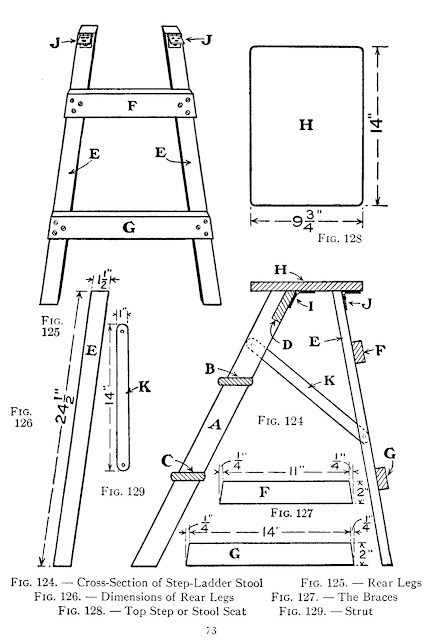 125), and the seat or top step (Fig. 128). The Side Rails of the steps (A, Fig. 120) should be cut of the dimensions shown in Fig. 121. Mark the ends to be cut to the angle shown, the top to be notched to receive an end of the crosspiece D (Fig. 120). The diagram shows the positions for steps B and C. The steps must pitch at the same angle as the rail ends. Groove the side pieces to a depth of 3/8 inch, to receive the ends of the steps (Fig. 123). You will see by Fig. 120 that the sides of the grooves must not be cut down at right angles, but at a pitch corresponding to that of the side rails, to accommodate steps B and C.
Figure 122 shows dimensions for cutting The Steps B and C. The ends of these pieces must be beveled slightly to make them correspond to the angle formed by side rails A. In assembling the rails and steps, first set the ends of the steps in the grooves in the side rails, and drive screws through the projections on the ends of the steps into the front edges of the side rails, also drive screws through the side rails into the step ends. Cut crosspiece D of the width and thickness of the notch in the upper end of side rails A, and of about the length of step B; slip it into the notches, nail it to the edges of side rails A, and saw off the ends flush with the outside face of the rails. The Rear Legs (E, Fig. 125) must be spaced the same distance apart, and placed at the same angle, as the side rails A of the ladder. Cut the legs of the dimensions shown in Fig. 126, and the pair of cross-pieces F and G of the dimensions shown in Fig. 127. Use the steps as a guide for fastening together legs E and crosspieces F and G, so as to get them of equal width. 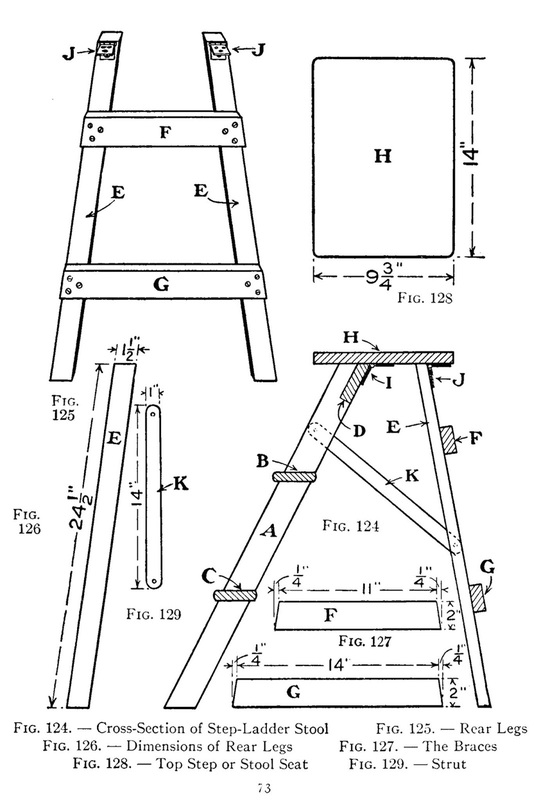 With the steps and rear legs assembled, prepare The Top Step or seat (H) by the pattern shown in Fig. 128. Then screw one flap of a pair of hinges (I) to the inner face of crosspiece D of the steps, the flap of another pair of hinges (J) to the outer face of rear legs E, and screw the other flaps to the underside of seat H in the positions shown in Fig. 124. The Struts K prevent the legs from sliding farther apart when the ladder is opened to the position shown in Fig. 124. Cut this pair of strips of the size shown in Fig. 129, bore a screw-hole near each end, and screw the ends both to rails A and rear legs E, as shown in Fig. 118. If the struts have been adjusted carefully, the step-ladder will fold into the form shown in Fig. 119, but not while weight is upon the steps. That is to say, the ladder will not fold up while you are standing or sitting upon it. 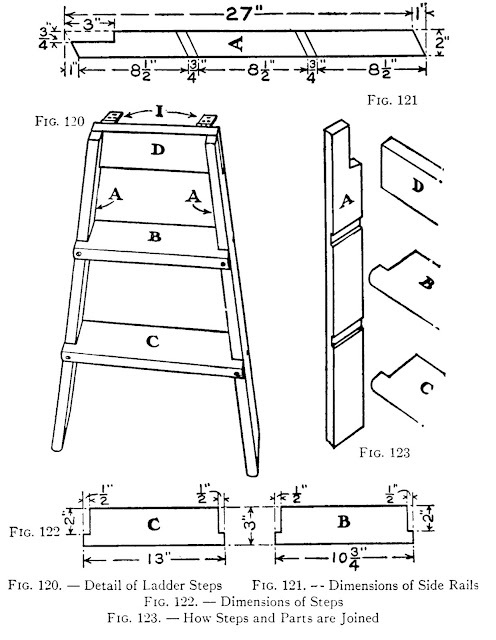 Excerpt from the book: "Carpentry & mechanics for boys: up-to-the-minute handicraft" by Hall, A. Neely (Albert Neely), Publication date 1918 / Publisher Boston: Lothrop, Lee & Shepard Co.